Every year during Yom Kippur, practitioners of a religious ritual animal sacrifice called Kaporos erect dozens of pop-up slaughterhouses on the streets of Brooklyn. For several days, over 60,000 baby chickens are intensively confined in crates with no food, water or protection from weather extremes. Many of them die of hunger, thirst, illness and exposure before the slaughter even begins, and the bodies of the dead decompose next to those who are still alive. The barbaric sacrifice takes place on public streets, where the smell of death is overwhelming, and the streets are contaminated with the blood, feces, urine and body parts for days. The massacre breaks seven health codes and exposes New Yorkers to salmonella, E. coli and other dangerous toxins and pathogens. 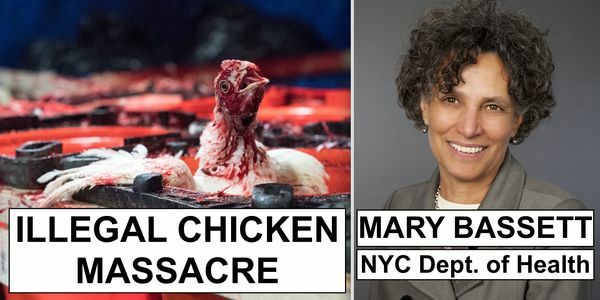 NYC's health commissioner, Dr. Mary Bassett, is in possession of a toxicology report confirming the dangers, yet she and other city officials turn a blind eye because the practitioners of the animal sacrifice represent one of NYC's most powerful voting blocs. Both the residents of these neighborhoods where Kaporos takes place AND the victims of the ritual need your voice to demand that Mary Bassett do her job by enforcing the laws that would prohibit this massacre from taking place.